Juno launched on Aug. 5, 2011, from Cape Canaveral, Florida. During its mission of exploration, Juno soars low over the planet's cloud tops—as close as about 2,100 miles (3,400 kilometers). During these flybys, Juno is probing beneath the obscuring cloud cover of Jupiter and studying its auroras to learn more about the planet's origins, structure, atmosphere and magnetosphere. Gotta love NASA's wandering "volcanoes" claims, as if mountains can move about. Nevermind that the hotspots are in all the wrong places, falsifying the tidal kneading guesses. The Occam's Razor explanation of the activity on Io is the hotspots are due to electric discharge phenomena occurring on the surface of Io. If the temperatures are below a 0 ° C hotspot then the article is correct. too many idiots. cantdonothing, io is basically made of molten sulfur. so yeah. mountains can move. go away to scrool or something. ......hotspots are due to electric discharge phenomena occurring on the surface of Io. Hahahahaha. Dear me, where do these people get this crap from? where do these people get this crap from? Currently they're just pasting random sciency-sounding words together and then adding "electric discharge" somewhere in the sentence. A bot would do better at making any kind of sense. io is basically made of molten sulfur. so yeah. mountains can move. Little icy Io at -130 degrees Celsius is now "molten sulfur". No comment of the volcanoes being in the wrong place, must be something "dark" that is responsible. Yes, molten sulphur. As detected. Also probably basaltic material, given the temperature. And why are they in the wrong place? Where would you like them? In orbit? Well, the unfalsifiable claim that gravitational tiding provides the heat and energy to power the apparent volcanoes also predicts where these volcanoes should be on Io. They're about as far off as they could be. "Our analysis supports the prevailing view that most of the heat is generated in the asthenosphere, but we found that volcanic activity is located 30 to 60 degrees East from where we expect it to be," said Christopher Hamilton, lead author. "We found a systematic eastward offset between observed and predicted volcano locations that can't be reconciled with any existing solid body tidal heating models." Just be cognizant of the fact that gravitational tiding isn't as airtight as you seem to believe. Sometimes it's not just a little off, the theory doesn't need tweaked, it simply doesn't work. Sulfur is only in the fourth place (with O2). "Possibilities to explain the offset include a faster than expected rotation for Io, an interior structure that permits magma to travel significant distances from where the most heating occurs to the points where it is able erupt on the surface, or a missing component in existing tidal heating models, like fluid tides from an underground magma ocean, according to the team. The magnetometer instrument on NASA's Galileo mission detected a magnetic field around Io, suggesting the presence of a global subsurface magma ocean. 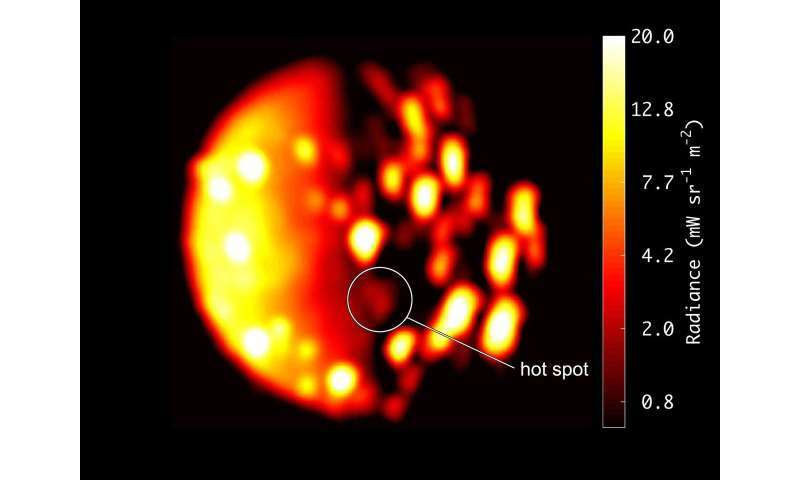 As Io orbits Jupiter, it moves inside the planet's vast magnetic field. Researchers think this could induce a magnetic field in Io if it had a global ocean of electrically conducting magma." Instead of rossim22's "it simply doesn't work," we have a magma ocean hypothesis for which there is magnet evidence. No, it is falsifiable. Which is why, using the orbital parameters, volcanic activity was predicted before it was seen. There is certainly no alternative, scientifically viable mechanism for the volcanism. That is another unfalsifiable claim unless we drill down into Io and strike magma. There are a lot of "ifs" in that hypothesis with more than one ad hoc assumption. It's unfortunate that most of these drivers for planetary phenomena always seem to be hidden in some way. That doesn't condemn them to be wrong, of course, but increases the possibility of confirmational bias in an industry that is predicated on receiving funding for furthering only established ideas. For instance, if everyone on earth already "knows" there is a sub-surface ocean on Enceladus because there "must be" then every explanation after it's not detected will assume it already exists (see: dirty snowball theory). That is another unfalsifiable claim unless we drill down into Io and strike magma. Errrm, no, we can detect the magma spectroscopically on the surface. It's unfortunate that most of these drivers for planetary phenomena always seem to be hidden in some way........is predicated on receiving funding for furthering only established ideas. Nope, we can measure the tidal bulge, and use that to work out the energy deposited in the interior, and the temperature it must therefore be. The rest of that is just the usual whine of cranks who have no valid hypothesis of their own. What about it? The Rosetta mission was spectacularly successful, and confirmed much of what we already knew and/ or hypothesised about comets, as well as revealing new data. It certainly put another nail in the coffin of the already dead and buried electric comet woo. Only hidden to lazy people that can't be bothered to do a basic internet search. There are many tools that can be used to study planet and moon interiors. Enceladus, for example, librates too much to be a rigid body, and in fact librates so much that the shell must be completely decoupled from the interior, i.e. it is floating. Subtle deviations of a moon's gravitational field away from spherical symmetry, due to both rotation and internal substructures, can be measured by repeated flybys of a spacecraft, as was also done for Enceladus, revealing evidence for a global layer of something with the density of liquid water. Two separate lines of evidence pointing at the same conclusion. Both links are speculation, without proof. If it is true that there is H2O, where is H2? The free H2 must exist in the atmosphere because there are no temperatures that remove H2 from the atmosphere. Naivians believe that fairy tales are proof. Why would something be worthy of Enceladus and not worth Saturn?